Our history began in 1924 with Vincenzo Gritti establishing a company specialising in the manufacture of mother of pearl buttons and accessories in Palosco, Lombardy. In the late 1930s, at the completion of his training period with the Palazzolo based button manufacturer TACCHIN -Italy’s leading producer at the time- , Vincenzo’s eldest son Carlo joined the company. Polyester accessory production is launched with technology imported from Germany. Ermanno Gritti, engineer and current president of the Group, takes the head of the company. This is the beginning of a new era which saw a number of changes with the internationalisation of the business and growing exports, verticalisation of the production process and direct sourcing from raw material producers. The range of articles decuples with the production of other natural materials such as real horn, corozo, wood, galalith and genuine leather. To accommodate growing logistics and production capacities as well as enhancing productive efficiency, the company moves to new premises in Grassobbio, Lombardy. At the term of his studies abroad and after completing his training period in the business, Paolo Gritti -4th generation of the family- joins the Group. He takes the internationalisation process of the company to the next level: the establishment of a production unit in Vietnam. 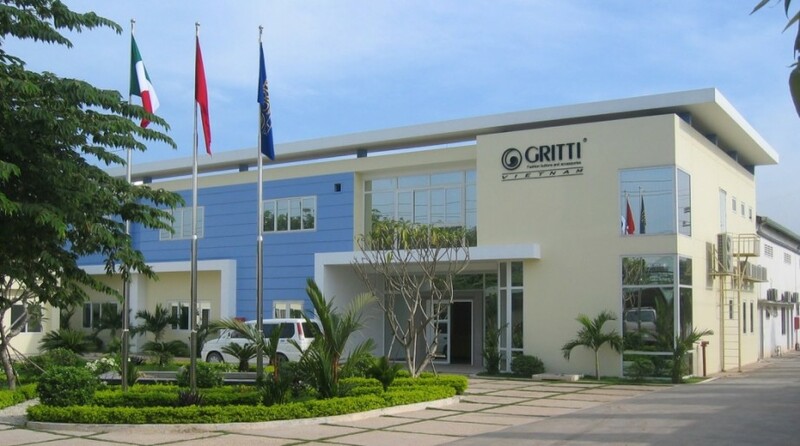 The GRITTI Vietnam factory is built according to European standards and starts as a fully integrated unit specialising in mother of pearl button production, from shell cutting to finished product. To extend the production of the Group article range, GRITTI acquires OCEAN s.r.l specialised in the production of metal injection and thermoplastics. Foundation of GRITTI & OCEAN Asia, Ltd. The foundation of GRITTI & OCEAN Asia, sees the group embarking on phase III of its internationalisation process and sets up a logistics base in Hong Kong, Asia’s business hub. Widening further its product range, the company acquires a polyester raw material and product manufacturing unit specialising in women- and childrenswear accessories. A new unit is built on the factory compound and is dedicated to polyester production –from raw material to finished product-, corozo, dyeing and varnishing departments. Having completed the first 3 phases of its internationalisation strategy with productive and logistics centres in Asia, GRITTI increases the momentum of its expansion in the States -one of the leading markets on the fashion scene- where the company had been exporting since the 1980s. The Group product range is certified OEKOTEX NORM 100 CLASS I, the strictest norm, both for its Italian and Vietnamese production sites. Installation of 3,000 square metres of photovoltaic panels on GRITTI Italian production plant generating up to 260,000 kWh/year. Set up of the leather laboratory: a highly qualified atelier to create masterpieces in precious leather.